Swaying in the autumn wind, autumn wind, autumn wind. Let wound pain, it hurt the tree. You will not have a second. Why the Indian middle class may resolve power problems! Indian cities are today bustling with opportunities, buildings and new multiplexes. But then look in a bit closer, there are problems. An important issue is uninterrupted power! Bangalore city is today not just famous for its IT and Start-up prowess, but also erratic power supply and the familiar noise of Diesel gensets. They experience at least 3-4 hours of power cuts every day. Unfortunate, yet true. A few citizens today are now setting up ‘rooftop’ solar panels and generating power. Apartment associations are also debating the long term return on investment of solar panels , inverters, power storage systems in long term. Although the initial cost of setting up a rooftop solar plant might seem higher, the average daily running cost is relatively cheaper. A diesel genset for example consumes 3-4 litres of fuel to generate 1000 watts of AC output. Simple math would tell you the cost is only going to go up for daily upkeep. While a rooftop solar project will cost less over a period of 5 years or much more. The middle class today buys apartments, villas and duplexes in the range of Rs.50 lakh to Rs.1 crore or even more. Would it not be efficient to set up a self sustaining electrical system as well? 13 Comments Why the Indian middle class may resolve power problems! As a wing which flew. Children sleep in their nest. And with your hand here. Holy ni increases boy’s house a virgin. Kiss and your hair beautiful. elegancy, classical and imagination below paradise! 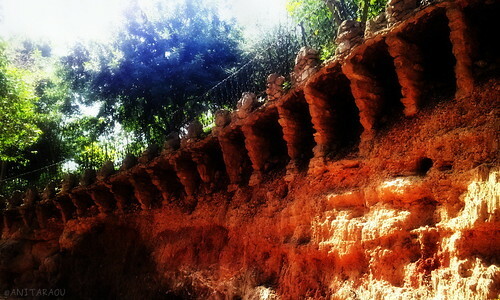 A wall at Park Güell. Though it’s only a boundary and not part of the main ‘attraction’, it’s impressive how even this mundane part of the place catches one’s eye in some manner. People, please, protect your and other people’s children! Source: People, please, protect your and other people’s children! Leave a comment People, please, protect your and other people’s children!